The Cocoa House or Casa de Cacao Baracoa stands majestically in the historic center of the city of Baracoa. The museum exhibits elements of history relating to the cultivation of Cocoa in the region and, as an added bonus, the history of the Mayan culture since it was they who initially started to cultivate cocoa around the year 600. The Cocoa Museum of Baracoa showcases a host of interesting tools and artifacts covering the whole process of not only the production of Cocoa but also its past marketing and health benefits that only today are physicians rediscovering. Of course, the museum also focuses on the local peasant traditions and the slave trade associated with such cultivations. Visitors get to see up close and personal all of the manual techniques and rudimentary chocolate preparation processes right from the initial cocoa mass. The museum showcases the treatments of the grains, their sun drying process in large drawers and finally the toasting on wood fires in special pots, cleaning and milling. Visitors can also process raw chocolate to make delicious treats by adding the sweet spices and wheat flour or bananas to make the final product which are small balls of chocolate, chocolate bars or the powder used in many drinks. 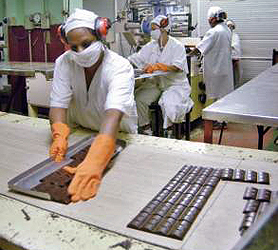 Above being a museum, The Cocoa House is also equipped as a modern chocolate factory for the production of tasty chocolates and chocolate bars. 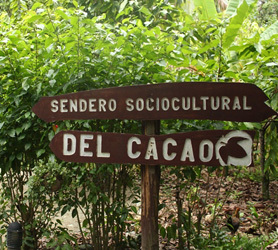 This whole process can be watched by visitors and they can even buy some freshly made chocolate from the factory. The Alejandro Humboldt National Park is considered the epicenter of the biodiversity of Cuba, it is located in the mountains of Nipe-Sagua-Baracoa and includes almost 70% of the protected areas of the Natural Reserve of the Biosphere surrounding the River Toa. An Ecological jewel of the Caribbean, it was declared a World Heritage Site by UNESCO in 2001. It covers 700 square kilometers and boasts 2% of the world flora species and some of the most densely vegetated areas of the Cuban archipelago and the Caribbean as a whole and exhibits a big list of endemic flora and fauna. 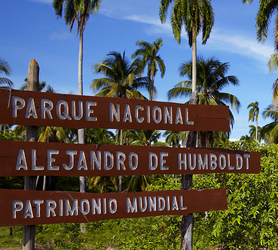 Named after the eminent German scientist Alexander von Humboldt who visited the island twice in the 1800s, the national park is shared with the provinces of Guantanamo and Holguin at its extremities and extensions. The park’s forests are a refuge for many endemic species of resident and migratory birds and the sea has a significant colony of manatees. This ecosystem is, in view of the visitor, a set of mountains, plateaus, plains, bays, rivers and keys. A very popular trail is the mountain of IBERIA, with a height of 740 meters above sea level, which among other things offers the Spring of the Santa Maria River, an impressive waterfall 25 meters high. Another interesting thing to do while in Baracoa is our boat ride tour through a section of the Toa River, the largest river in Cuba. 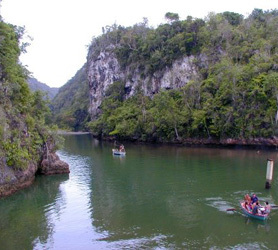 The tour offers Nature and adventure, a unique experience along the Toa River, bordering our farmer’s real life plantations putting you in direct contact with the protected nature reserve of the Sagua-Baracoa massif. Nearby birds abound and are easy to observe, including rare species of great scientific and ecological value such as; the Almiquí, the Polimita (yellow, red and brown endemic to our hills and forest) the Parrot and the Tocororo amongst many others. At midday we will stop for a break, mooring the boats on the banks of the Toa river at our rustic ranch and indulging in a true Baracoa style farmers lunch with traditional dishes exclusive to our region and we are sure you’ve never seen or tasted before buy you’ll undoubtedly love! At just 6 kilometers from Baracoa’s city center on the road to Moa, you’ll find the Finca Duaba nature farm boasting insights into the rural way of life in our region and the fascinating world of cocoa production and the strong Cocoa bean traditions in Baracoa. Wandering through the paths of the farm you’ll also discover precious fruit trees and the procedures employed for harvesting and processing them according to the methods still used by farmers in the area. The onsite restaurant is divine, offering all typical dishes of the region which are not often easy to find, a true culinary delight of delicious food some of which use chocolate as an ingredient. El Yunque or Anvil Mountain is an elevation of vertical slopes and flat top 8 kilometers away from the city. El Yunque became a local symbol and orientation point for the seamen who crossed through the adjacent seas. The Anvil Mountain fauna is rich and diverse, with plenty of woodpeckers, the Tocororo (Cuba’s national bird), hummingbirds, hutias, lizards, reptiles, and other species. At a height of 573 meters El Yunque offers a natural viewpoint over an immense lagoon and the vast landscape of green mountains surrounding the City. 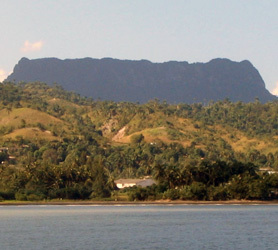 A perfect vantage point to see Baracoa’s numerous rivers and streams as they meander into the bay of Baracoa. Anvil Mountain known locally as El Yunque, was declared a National Monument in 1980 due to its natural and historic values to seafarers. Baracoa Cuba Travel – Live Help?